While not a part of Yarnivore, you might be interested in products and services from the following folks! 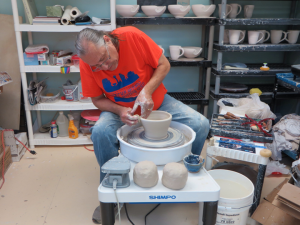 have a small studio and can throw pots whenever I want. I like to think that any artist's work is a gift she or he presents to the world. The act of taking a ball of clay and forming it into something useful and beautiful drives me to do more. I am most drawn to making functional pottery that is beautiful and a joy to use. I feel wonder and awe as a form takes shape in the wheel and realize I am doing the same thing an artist in China did thousands of years ago. I prefer my pieces reveal they were handmade... i.e./ the spiral on the clay formed when I pull a bowl or mug. I am attracted to the organic feel of it. Most of all, I like to see people smile as they find something that "speaks" to them. That is what art is about. It is connection heart to heart with the creative in all of us. 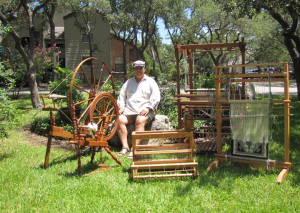 I am an amateur woodworker whose passion and specialty is spinning wheels, drop spindles, looms and other fiber arts tools. Do you have a loom or wheel that hasn't been used since Great-Grandma owned it? Or perhaps you own an antique store find, that you thought could only be a display piece? I feel the tools created for fiber arts should be appreciated as both a thing of beauty and also used for their intended purpose. From tune-ups to significant reconstruction and custom woodworking, I can help return your treasures to working order. Sometimes I find signs of previous repairs, or how the initial craftsman did his work. It's as if I'm hearing stories from years gone by... tales from the wood. Let me help bring your wheel or loom back to life as "functional art."